Over the past few weeks I have had my eye out for an Original Co-Sleeper on Craigs list or E-bay. 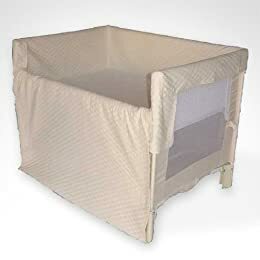 I have it on my registry but it is the one item I would feel better actually having before the birth so I have been looking for deals and also thinking about just flat out buying it myself. I searched months ago on my local Craigs List and found that there were a few in the $100 range every few weeks so I though I would be ok waiting because at the time I had not fully decided I needed one. To that point, I wonder if this is a Midwest thing or if our Craigs list is just more active then other places. I decided to search all the other ‘local’ listings (Duluth, Fargo, Rochester etc) and they have nothing, same with all the slightly further cities and I even searched NY and there isn’t one mention in the last 2 months on any style at all! How can something so hot in the twin cities be completely absent from the rest of the lists? I’m sure it is a local market driven thing, people have them and search the system to see if others are being sold, if none are they don’t list figuring there isn’t a market and there will never be a market if none are listed and people don’t see their local Craigs list as a source for this type of thing. Chicken and the egg of economics. I guess I’ll just consider myself lucky that I live in an area where the market not only exists but is strong for baby goods. Weekend review; In semi typical fashion last Thursday there was an emergency with Lars’s work and he was 99% sure he could not go to the even that we had planned. Since we promised a court, I still was going to go so I amended plans but didn’t write Lars off as this has happened in the past and he was able to come them too. I even had all his stuff packed on Thursday night and I could have just left that bag home but I knew it was easier to have it all handy. I got home from work at 4:15 and told him I was going to leave in 40min and he said “wait one hour, I think I can go!” and in the end he could and I’m very glad because it was a fun event and it was a really icky drive with lots of people in the ditch. The event itself was mellow and fun and we had a good little court and I think everyone had a good time. We got home about 1 am and I slept in until 10 the next morning. I had a headache so not too much got done yesterday but I made another dent in the baby room and our closet organization and I should be ready for furniture removal and rearranging this week and maybe a trip to Ikea next Sunday for the little things I need. I feel slightly bad burying this in the third paragraph, but, Thursday we had a sonogram and we are now very sure we are having a GIRL baby. The sonogram machine was brand new and was very high resolution so we saw tons of details. In my opinion she has my chin and neck and she did a cool little neck stretch yawn while we were watching. She looks like she has Lars’s nose and feet (princess toes at least) and her knees and ankles look a very feminine. The pictures this time were sub-par, she was a little annoyed by the time the picture time came around so the perfect profile we saw in the beginning was mashed into the placenta and she decided to curl up into a ball. We are both excited to finally know what we are having and I was excited to hear she only had a 7cm head (so far) and there is 9 weeks left so I’m hoping she does not turn into a melon head between now and then. More baby stuff – I officially changed doctors to one that a friend liked and he seems much happier to be in the baby business. He has 30 years experience so he must really like it and he was much more pleasant to have an appointment with. The only down side is that he is one of the more established doctors therefore he has less open times but I’ll make my schedule flexible in order to not dread every appointment. He also ordered the aforementioned sonogram because I really really wanted another one and I was willing to go get a mall sonogram but they require a note saying you are getting adequate pre-natal care so I asked for that and he found a reason for it to be done at the office, not at the mall. Very good sign that he actually heard me when I said I wanted something. This week I have an all day seminar on Thursday that I have to get up super early for and relatively busy week but other then one baby class no evening activities. Last week Thursday afternoon and Friday all day I felt a bit under the weather and knowing I had a big weekend I stayed at home and worked. It was nice to both get work done and work at home done and I didn’t have to rush anything I needed to do for 12th night. Sunday I slept in and then Lars and I tackled the closet project. I took pictures but it is hard to show how poorly our closet was set up. The closet door opened into the closet thus taking up a whole wall because unless you wanted to get into the closet and then close the door, you could not get to the wall behind the door. The project ended up easier then I though because there were premade shelves on sale in the perfect dimensions and for once everything we needed at Menards was all in one spot. So the idea was to add four 2 foot long shelves, 2 for me and 2 for Lars for stuff we intend to wear again, a pegbord to hang sweatshirts and accessories on, and an additional two high up shelves the entire length of the wall (above the door frame) for putting out of season stuff on. I got all this in and usable in about 2 hours. I need to start getting Lars to use the new system instead of making a large pile of stuff in the to-be baby room but he is willing (he says). I also removed a big pants rack we were not using anymore and put in more hanging space and removed a small set of drawers that I’ve stopped using so now I have room for laundry in the closet. The only thing that stinks is that since there is no door, I can’t close the closet… I’m on the lookout for wardrobe doors that can be remounted in the existing frame but that can wait. All this was in an effort to more our stuff out of to-be baby room so I can get it totally cleared out and then just put back stuff for a baby, I hear they like sleeping in cribs not laundry baskets. 1 – the dula has been hired. We more or less had a choice of one because all the others lived too far away so we met her and liked her and hired her. A dula is in the same family as a midwife but she does nothing medical, she advises Lars and I on options before and during delivery and makes sure we don’t get railroaded into something because of lack of information. We have no idea what Dr we will get but the dula will meet with us 3 times before my due date so she will have a very good idea of what we want and will help inform the staff. She won’t make decisions for us but we both feel better knowing someone will be looking out for our interests and know what we want. She is also experienced with different stretches and positions to help with labor and she is a lactation expert too so I think she will be an asset to our team. 2 – In a fit of rare energy, I actually baked a ton of stuff for 12th night, tomorrow I need to start individually packaging it so it can easily be given out. 3 – Lars and I finally registered for baby stuff. We went to Target and zapped a bunch of stuff. I am disappointed with Targets toy and book selection and prices so I might spend some time on amazon too. A friend was absolutely appalled that we had not registered and is ‘putting her foot down’ about us not having the room finished (or even started) yet. 4 – I finally have a plan that might really work to reorganize the stuff in the to-be baby room so that a baby will fit. It will take a little bit of doing but I can do most myself I just need help moving the two large furniture items out of the room to the down-down stairs. I’ve decided not to paint, half because we don’t know gender and half because I don’t really know what color would really be good. I think I might make new curtains, the brown ones in there are un-inspired to say the least. I need to dedicate 2 weekends I think, one to building what I need in our room to reorganize and one to actually put together baby stuff… I have roughly 10 weekends left and 4 of those we are going to events so if anyone wants to come help I might be able to get it done in one weekend. 5 – The baby is moving around a lot more, lots of squirming and radical sudden belly movement. I’m really fortunate that I’m doing fine with this, no real problems with swelling or aches or pains. I’m still able to touch the ground and to get up off the floor or anything I choose to sit on and I really don’t get too out of breath during my running. I hope I’m not tempting fate with that statement but so far so good and pretty soon I can start counting down not up. That’s about all the news around here, tonight is baby class #3 so I must go. Other then work, Lars and I went to the 2nd of 6 child birth classes and we got to see the ‘birth video’. It was really not so bad, the strange thing was the nurse talked through the entire process using charts and visual aid and then we watched the video and they were almost word for word the same. We could have really skipped the lecture for the video but I suppose hearing it twice doesn’t hurt. It is nice to have a night out with Lars at least and we try very hard not to mock some of the people in our class who just don’t seem to get it. It is also nice to see that I’m in much better shape then the average pregnant person. I’m about a week behind most of them but I can still get up and down off the ground without a forklift and I can easily do all the exercises and I can still even touch the ground (can’t touch my toes because the belly is in the way). Yesterday I went shopping for a few things and I got all the baking supplies to make a ton of little gifts for 12th night. I am making little devil food bites in the mini muffin pans and so far I have 6 big containers full in the freezer. I plan on taking them out Friday afternoon and packaging them, hopefully they are still fresh and nice for Sat. Today I need to make the second batch and then I need to give some regalia the once over so I’m ready for the event. We also plan on registering for baby stuff today at some point, I am starting to see that I only have 12 weeks max left so I have alot to do both at home and at work.